As we count down to Hari Merdeka, its time to remember our heroes. It was a far cry from the the incident at Bt Jenalik where 5 persons were honoured with the nations highest awards for gallantry. Two with the S.P and 3 others with PGBs. In the fiery Battle of Bukit Kepong only one policeman was awarded the lowly Colonial Police Medal Medal for Gallantry. Battles at 2 Bukits with very different kinds of recognition. 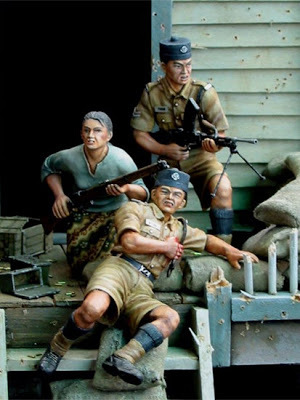 THE battle of Bukit Kepong is a tale of guts and bravado displayed at its very best, where men, heavily outnumbered and outgunned, fought on to the very last knowing well the out- come was already determined. It was our very own "Alamo". It was 4.30 in the morning of Feb 23, 1950, when an estimated 180 communist terrorists (CTs) launched a cowardly attack on the Bukit Kepong police station in Johor, which was manned by a small group of policemen. In the battle that lasted about five hours, the CTs killed 13 policemen, six Home Guards, three women and a child. Only four policemen escaped with serious injuries. That morning, it was not the number of policemen in the fight that counted rather it was the fight in them that really mattered. As we celebrate our 54th independence anniversary, it's time to reflect on the sacrifices of our security forces, which helped to make Malaysia a peaceful country. If we are indeed a grateful nation, we will also not forget the sacrifices of the thousands of Britons, Gurkhas, Australians, Rhodesians, Fijians and New Zealanders, who fought along- side us, to win this war against forces determined to impose their foreign ideology on our people. On April 19, 1960, the then Yang di-Pertuan Agong Tuanku Abdul Rahman ibni Almarhum Tuanku Muhammed, in his speech in Parliament, said: "The debt which the people of this country owe to the security forces, both Malaysian and the Commonwealth, for their sustained and courageous effort over the 12 years of Emergency cannot be over- emphasised." Now member of parliament Mohamad has ruffled the feathers of Malaysians by his alleged remarks that those who attacked Bukit Kepong police station were heroes because they were freedom fighters, and not because they attacked the Malay policemen. This alleged remarks are an insult to not only all family members of these policemen but also all members of the armed forces, past and present, that bore the full brunt of the atrocities committed by the CTs. As advised by DAP chairman and MP Karpal Singh, Mohamadshould withdraw his remarks and apologise to all he had hurt. As we laud the bravery of these Bukit Kepong heroes today, it's time to reflect if, as a nation, we had played our part in ensuring the welfare of these policemen and if their families had been well taken care of, even if they were once serving under colonial rule. It was reported in the New Straits Times of April 15, 2005, "Last BukitKepong hero dies", that Sergeant Yusoff Rono, 83, died a bitter man. He felt the country had forgotten him and regretted that the government did not give him and his comrades the recognition they deserved. His son Nazri, then 35, was quoted as saying the government did not value his father's contributions. As far as I know only one policeman was awarded the Colonial Police Medal (CPM) for gallantry by the British government . Our country gained independence seven years later, yet these heroes and the families of those who perished did not receive any significant acknowledgement from the authorities. In the case of Yusoff, all he had to show for his heroism was a medal, Pingat Jasa Kebaktian, from the Malacca government and that, too, 48 years later. When Yusoff died, there were immediate overtures to assist the family. The then deputy home minister visited the family to discuss the possibility of conferring Yusoff a posthumous PanglimaGagah Berani, the nation's second highest award for gallantry. The Malacca chief minister had also said the government would publish a book on Yusoff's struggles during the Emergency and consider giving the royalties from the book to his family. Why did the authorities wait for this ailing 83-year-old to die before coming forward with offers of help? In addition, what about all his comrades who had passed on?